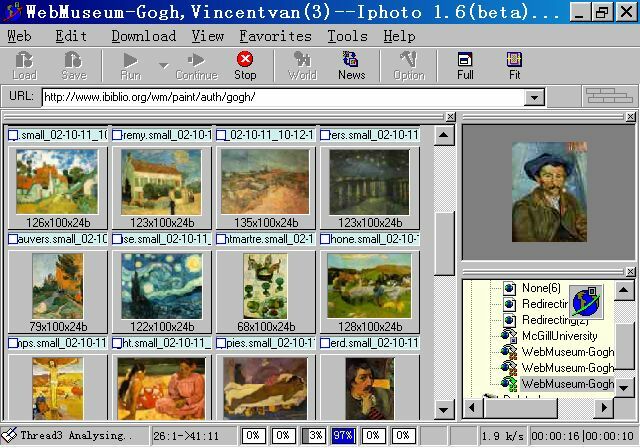 A tool of downloading and presenting images from the web sites ! Iphoto includes Web Pictures Downloader and Web Pictures Searcher. Iphoto is an easy-to-use Internet application that allows you to download pictures from the web. Iphoto includes Web Pictures Downloader and Web Pictures Searcher that can access your favorite web sites with a maximum of 8 threads simultaneously. It saves you both time and energy. There are a lot of web sites owned thousands of photos or pictures. With the advent of broadband technologies allowing faster transfer of information over networks, more and more people hope download images quickly and conveniently. Of course you can access the pictures using web browser and save them one by one. But this is the case to waste your time. Let Iphoto do the job automatically. Iphoto use WEB PICTURE PREVIEW technology which make Iphoto be the ONLY software enabling you preview the pictures before download them. Now, Iphoto includes Web Pictures Downloader and Web Pictures Searcher. WebGrab - The simple way to download and organize Web pages, A powerful Web Site Grabber for you . Web Pictures Grabber - Powerful Images grabber, Web Pictures Grabber software, Search pictures and images from web and download them automatically.